Total indoor comfort is just a phone call away! Get fast solutions to your HVAC issues with Affordable American Air Conditioning & Heating. Free estimates available on replacements. Call us today at 281-704-3696 for service in The Woodlands, TX. Have you been looking for a reliable HVAC professional? Make your first choice Affordable American Air Conditioning & Heating. Founded in 2009 by Chuck Blair, we are a veteran-owned company serving The Woodlands and surrounding areas. Our team is dedicated to providing top-notch solutions that leave you with greater peace of mind. You can count on us to deliver the results you need so you can enjoy the comfort of your own home without worrying about unexpected equipment breakdowns or failures. Curious to see what others are saying about our services? Click here to read your neighbors’ reviews and see if we are the right company for you! 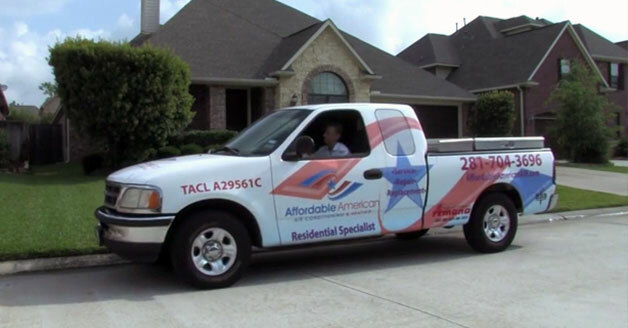 Affordable American specializes in high-quality HVAC solutions for our neighbors throughout The Woodlands, TX and nearby communities. We are passionate about customer service and take a genuine interest in our customers’ concerns. You can always expect friendly support when you contact us. Our technicians are not only knowledgeable professionals, but they are also interested in developing relationships with each and every customer they serve. We take pride in our work and do everything we can to make your experience with us as smooth and pleasant as possible. This means prompt service, clean work areas, and full transparency throughout the job. We go above and beyond to deliver the level of service you deserve, and make it our priority to provide solutions that exceed your expectations. At Affordable American, we bring industry-leading technology and knowledge to better serve you and your family. Our team completes technical and customer service training on a regular basis, keeping us up to date on the latest improvements in indoor air efficiency. This allows us to provide you with the most reliable, cost-efficient solutions. You never have to worry about problems recurring when you choose Affordable American. Our services leave no detail overlooked, which means potential problems are handled before we consider the job done. We also provide annual equipment maintenance and tune-ups to keep your home as comfortable as possible no matter the season. If you are looking to save money on repairs and replacements, give us a call to discuss our annual maintenance program. Our goal is to help you return to your normal routine ASAP so you can focus on the things that matter most to you. Work with us today and experience the difference with Affordable American. Don’t let HVAC trouble interrupt your day-to-day routine. Get immediate help with Affordable American Air Conditioning & Heating. Call us today at 281-704-3696 and start breathing easier!